A lot has happened since our last blog post in December! Heather and Richard successfully submitted their PhDs, James, Josie and I all had our PhD registration confirmed, and Frank has been awarded a significant grant from the AHRC (UK Arts and Humanities Research Council) and FAPESP (São Paulo research council, Brazil) for a major upcoming project. But while each of these things could probably have a post to their own, I wanted to give a bit of space here to look at a paper that Maca, Frank and I have recently had published. Brazil’s Araucaria forests are iconic, diverse and ancient, but they’re also among the country’s most threatened ecosystems. 20th-Century logging reduced their area by up to 97% and, with their adaptation to relatively cool, constantly moist conditions, climate change is a looming threat. To understand how the forests will react it’s important to learn from their responses to past climate changes, but this is complicated because human activities may also have shaped the region’s vegetation dynamics in the 1,000 years or so. Our study aimed to help disentangle these two drivers of change in the Araucaria forests by giving key insights into how the biome is represented by its key palaeoecological proxy, fossil pollen. We aimed to find out how well pollen rain could tell apart structurally different forest patches, and how over- or under-represented key trees were in their pollen. Although Araucaria forests’ modern pollen rain has been described before, this was the first time its relationship with the vegetation has been described in a quantitative way. We found that, although structural differences between the forest plots were plain to see, they weren’t clearly reflected in the patches’ floristic composition. Pollen tends to have lower taxonomic resolution than vegetation surveys (it’s difficult – sometimes impossible – to tell the pollen of closely-related species apart), so it was therefore unsurprising that the plots couldn’t be distinguished by their pollen rain either. It’s possible that bigger or longer-standing structural differences would have been detectable, but this finding suggests that subtle human impacts in Araucaria forests may not be easy to pick up with fossil pollen. This figure shows the differentiation of the forest plot types according to their vegetation (top row) and pollen (bottom row). Plot types are denoted by their colour and by their suffixes (op=open, cl=closed, di=disturbed, ro=rocky outcrop, sl=slope). 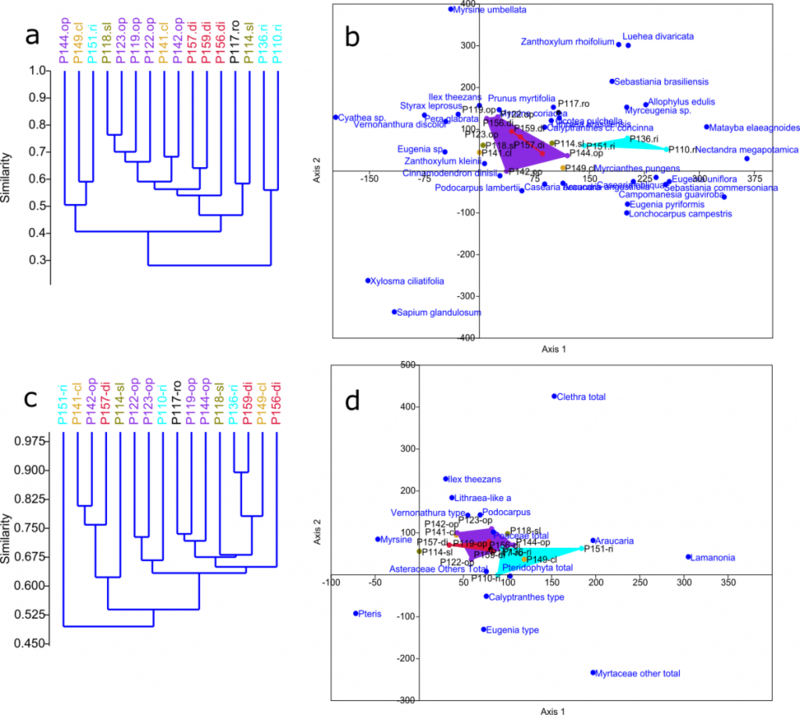 The lack of coherent clusters in panels a and c, and the close spacing of the various plot groupings in b and d, show the patches’ similarity. The difficulty of identifying complex changes in the forests is further emphasised by our second main finding. 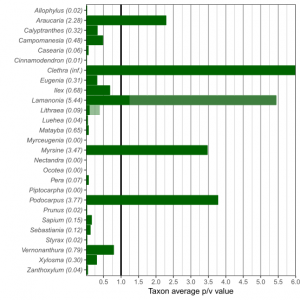 We calculated p/v values (a taxon’s pollen abundance divided by its abundance in the vegetation) for 27 tree genera. A p/v value of 1 would mean that a tree is equally present in both pollen and vegetation, a value of 2 would mean it’s twice as common in the pollen rain as in the landscape, a p/v of 0 means a plant’s growing nearby but isn’t found in the pollen sample, etc. Only five genera had p/v values higher than 1; by contrast, four had p/v values of 0, and 16 others had values less than 0.5. This means that pollen only provides good information on a small minority of the trees in this highly diverse forest – changes in the many under-represented taxa simply may not be captured. Logically, the over-represented taxa are the ones most often cited in palaeoecological studies, but these results suggest that analysing changes in rarer pollen types may also be important for understanding the ecosystem’s dynamics. p/v values for 27 key Araucaria forest tree genera. Clethra technically has an infinite score (found in the pollen but not the vegetation survey); the paler sections for Lamanonia and Lithraea reflect different ways of calculating their values. We hope this research helps find plot a path towards a fuller understanding of how past human and climate impacts on Araucaria forests are reflected in fossil pollen analyses. And, by putting numbers on the relationships between the forests’ trees and the pollen they produce, we hope to enable the increasingly accurate interpretation of these vital palaeoecological records. Our study is published in Review of Palaeobotany and Palynology (https://doi.org/10.1016/j.revpalbo.2019.03.003). You can read and download it for free before the 22nd of May 2019 at this link: https://authors.elsevier.com/a/1YqF97uTvRX4z. After that date, please get in touch if you want to read the article but can’t access it online. 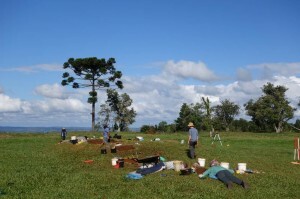 Macarena L. Cárdenas, Oliver J. Wilson, Lauri A. Schorn, Francis E. Mayle, José Iriarte (2019), A quantitative study of modern pollen–vegetation relationships in southern Brazil’s Araucaria forest. Review of Palaeobotany and Palynology 265, p.27-40, https://doi.org/10.1016/j.revpalbo.2019.03.003. Lead Supervisor: Francis Mayle, Department of Geography & Environmental Science, University of Reading. Co-supervisors: Joy Singarayer, Department of Meteorology, University of Reading; Richard Walters, Department of Biological Sciences, University of Reading. The extent to which pre-Columbian (pre-AD1492) human societies transformed Amazonia from a virgin wilderness into a domesticated landscape is one of the most contentious debates in tropical ecology. The old paradigm of Amazonia as a pristine wilderness, little impacted by millennia of human occupation, has been challenged in recent years by remarkable discoveries of monumental earthworks across much of southern Amazonia. However, although it is clear that these ancient ‘earthmoving’ societies transformed their physical landscape, the extent to which they also domesticated their forests – e.g. via burning, deforestation, agroforestry – is highly contentious. The degree to which the biodiversity of Amazonian rainforests was shaped by millennia of human land use is highly relevant for understanding current patterns of biodiversity, rainforest resilience and land-use sustainability. 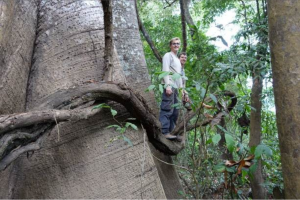 The overall aim of this project is to determine the impact of Pre-Columbian societies upon Bolivian Amazonian rainforests – with respect to scale of deforestation, use of fire, and enrichment of forests with economically useful species. a)Palaeoecology– fossil pollen and charcoal will be analysed from lake-sediment cores to reconstruct local- and regional-scale histories of pre-Columbian forest impact over the last 2,000 years; i.e. scale of forest clearance and type of forest management (e.g. agroforestry, fire) associated with this mound-building culture. b) Modelling–an agent-based model will be developed (using NetLogo) to provide insights into the process by which this ancient culture domesticated these rainforests, and the extent to which a legacy of this ancient land use exists in today’s forests. The student will parameterize the model using their palaeoecological data, together with previously published palaeoecological, archaeological and anthropological data, as well as floristic data from the RAINFOR ecological plot network. Training in field- and lab-based palaeoecological techniques will be provided by Mayle, which will include a 4-week fieldtrip to the Bolivian Amazon. Training in agent-based modelling will be provided by Singarayer and Walters. Further training may be acquired via relevant NERC Advanced Training Short courses if need be. At least a 2.1 BSc degree in biology/geography/environmental science is required. 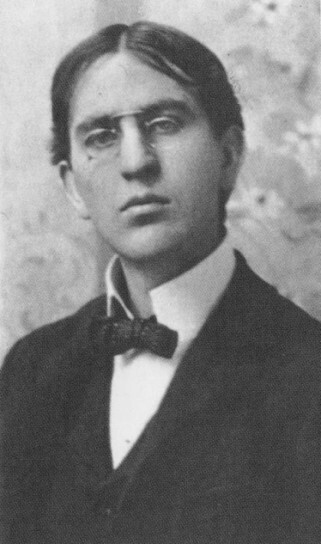 A strong background in numerical/statistical techniques is essential. Knowledge of ecology and microscopy would be advantageous. The season’s first conference was Intact Forests in the 21st Century, at Magdalen College Oxford. I have to admit, initially I felt like a bit of an impostor – after all, I work on Brazil’s Atlantic Forest, one of the most fragmented forests in the world – but I was there in connection with a side project we’ve been working on looking at Amazonia. 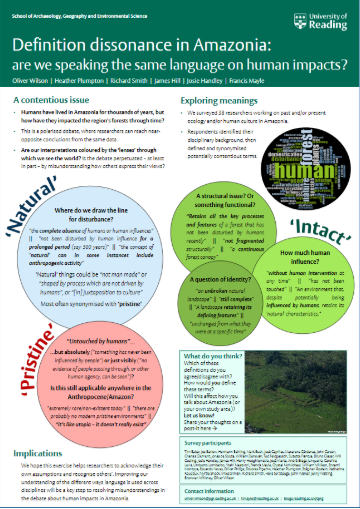 There’s a long, ongoing and quite contentious debate about where the biome sits on a scale from ‘pristine’ to ‘anthropogenic’, so for a few months we’ve been surveying researchers about their definitions of key terms used in these discussions. Do these differ with the respondent’s disciplinary background? Is my perception of a ‘natural’ forest the same as yours? 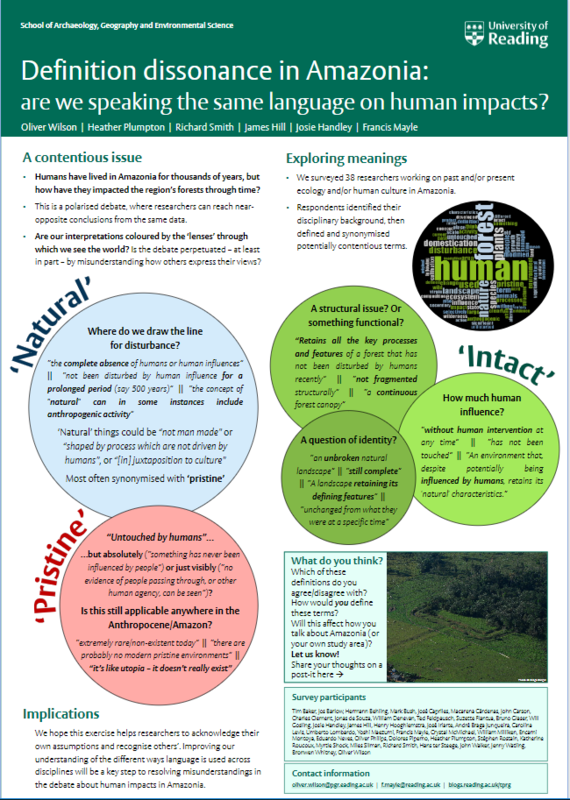 And – relevantly for this conference – what do people mean when they write or read ‘intact’? Our poster had some results from a preliminary analysis of the survey, showing the diversity of opinions among our 30-odd respondents – if you haven’t taken part and would like to, then get in touch! A thousand years ago in southern Brazil, the unique Araucaria forest expanded rapidly over highland grasslands (campos), a change that’s largely been attributed to climate changes. At the same time, the southern proto-Jê people, whose diets and culture were interwoven with Araucaria trees, flourished. Given the close connections between the people and trees, and the timings of their expansions, might the Jê have been more important for that last forest expansion than the climate? So far, concrete evidence to address this question has been lacking – but two recent studies set out to provide just that.